A little bit of me: Will I survive Friday the 13th? Will I survive Friday the 13th? 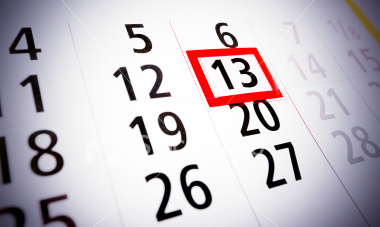 Between myth and superstition it’s Friday the 13th again! And if everything in Lebanon acts crazy when it rains (phone lines, internet connections, drivers, people, etc…), then you can’t come to imagine how a superstitious Lebanese can spend every 13th of the month… now how about Friday the 13th? It’s needless to say that the Lebanese can get superstitious about anything and everything so below is a guideline for spending a day away from your friggatriskaidekaphobia! Get out from the left side of the bed in the morning, the right side brings bad luck. Before you move out of the room, don’t forget to wear that little blue broche (kharzé zar’a) your grandmother got you when you were born. It will keep the “bad eye” away for the day…3ayn el hasoud tibla bil 3ama! While washing your face, recite and bad dream out loud. The water will take it away with it and any probability of it coming true will fade! Leave the house with your right foot (obviously, the left one brings bad luck today!). Black is your official enemy for today. Seeing black will make your days black (and sad) for a long time. Now if your car is black, use a cab! Fall in-love with blue today! Unlike black, blue can keep away bad eye and bring good luck… You know they even advise brides to wear something blue on their wedding day no? Where did you think that comes from?! During lunch time, order eggplants with your colleagues and try to have the last bite. They say if you share eggplants, the last bite brings good luck (OMG! I don’t eat eggplants, will I die today?). Keep salt with you during the day. For every bad news you hear (lasamah allah akid), pour a little in your left hand and throw them over your right shoulder (or was it right, hand left shoulder… mmmm I don’t remember so be safe and try both!). If your day seem to be going bad, you can prepare yourself a Turkish coffee pot, fill a cup (shaffé works better) and let it spill. Spilling coffee brings good luck and luck is much needed on such a day!PS: ONLY Turkish coffee works! And before you go to bed at night, do not look in the mirror… because you’ll look too stupid for believing in the superstition of Friday the 13th! Wlak hiyyé aslan isma Beirut!